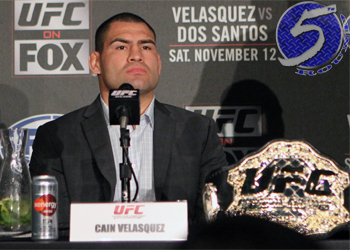 Everybody witnessed what took place inside the Octagon at UFC 155, but only a handful of people got to feel the tension and intensity hovering in the locker rooms of Cain Velasquez (Pictured) and Junior dos Santos last Saturday. Thankfully, the Ultimate Fighting Championship has released video of the heavyweights as they prepared for their rematch, so now all fight fans can get up to speed. Velasquez vindicated the only blemish on his résumé by steamrolling dos Santos to reclaim his throne. UFC 155 took place inside MGM Grand Garden Arena in Las Vegas, Nevada.